The Return of Marcus Sextus by Pierre Guerin., Part 15 of the Introduction to Art and Artists of Our Time. From the painting by Pierre Guerin. PIERRE GUERIN was another artist of the time who achieved no little distinction for himself; at one time, indeed, he was the recipient of extraordinary honors, but his influence has made itself felt rather through his pupils than by means of his own works. He was born at Paris in 1774, and was a pupil of Regnault, the chief of one of the schools that stood as rivals opposed to that of David. 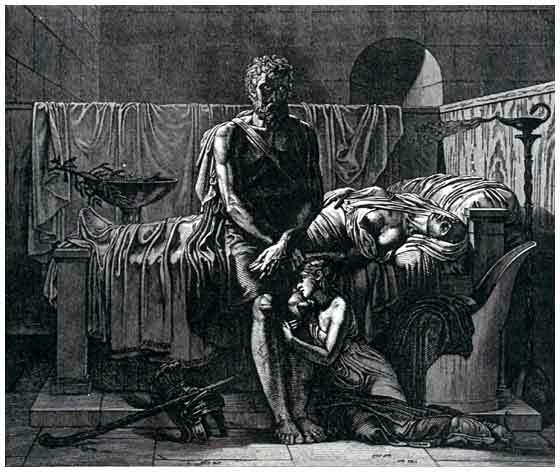 He gained his first laurels as the painter of the "Marcus Sextus returning from Exile, finding his Wife dead, and his Daughter weeping by her Body." It would not appear that Guerin had any particular reason for choosing such a subject; it was in accord with the spirit of the art of his time, which was almost exclusively literary in its origin, but, however it may have been in this particular case of Guerin, it happened that his picture appeared at a time when events gave it a remarkable significance. The émigrés were returning from France in greater and greater numbers, and most of those who came back were people of importance; their adventures and misfortunes were the object of universal interest in the world of Paris; and the picture of Guerin became the centre of attraction in the Salon of 1779. "In the grief of the exiled Marcus Sextus," says Delecluze, from whom we borrow this account, "the miseries of all the exiles were seen concentrated, and all classes of society were stirred by a common impulse, admiring alike the work itself, and the presumed motive of the young artist in painting it." During the three months that the picture was on exhibition in the Salon, it was constantly surrounded by a crowd of visitors, and the painter himself was the object of such a succession of orations and triumphs, that his health, always feeble, was nearly ruined by it. Beside the invitations he received from the old aristocracy, the bankers, the leaders of fashion, and even the members of the government, all the theaters sent him tickets of admission, and he never appeared at any of these entertainments without finding himself the recipient of applause of his entrance. It must be confessed that in spite of the somewhat theatrical effect of this picture, an effect which hardly a single picture of the time that dealt with historical subjects knew how to avoid, there is a deep and sincere vein of pathos in it, as indeed there must have been, to enable it to produce such a tumult in the popular mind.